Most site owners are pretty good about ensuring their images have alt tags, especially ones that might also be used as links, as Google will use that alt text for SEO purposes. But John Mueller had an interesting side note about the use of images when they are on a mobile site, which could have a pretty big impact for the upcoming mobile first index. 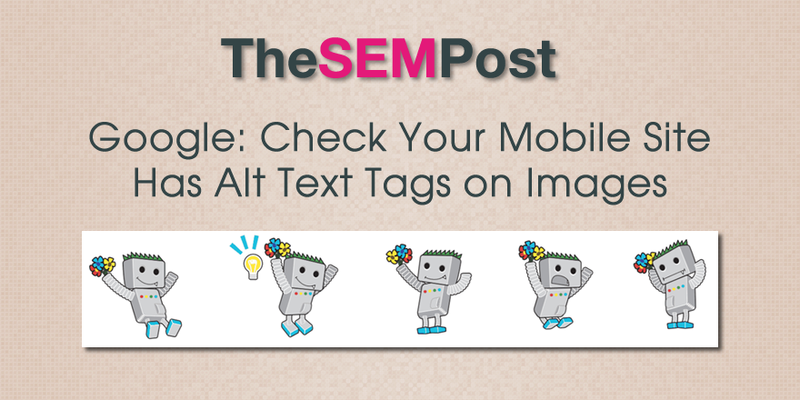 Specifically around images in general, so not specific to image links, but images in general, especially on mobile, make sure that your images on mobile also have an alt text. This does make me wonder if this might be an issue Google is seeing as they are crawling and comparing desktop versions of a webpage with a mobile version, in preparation for mobile first index, where Google will be swapping over their search index from the desktop version of a page to the mobile version. We do know that links in general is one issue with mobile first, so it is likely that it is something they are seeing with links as images as well on mobile. Bottom line, when auditing your website in preparation for mobile first, checking that your images have appropriate alt tags should be on your list. And don’t forget it isn’t strictly for SEO purposes, it is for usability purposes too, for those who can’t load images due to internet connection speed and for web accessibility reasons.